July | 2011 | invincible inc.
I’m so excited that August is finally here. In 3 days, I am packing up my car and driving to Scranton to live there FOREVER. I have a few projects in the works, and a lot of work to get done. We had a fantastic party yesterday (more on that later this week), and I have 3 days left at work to wrap things up and say goodbye. After 13 years in Connecticut, I’m really happy to get back to my home and my family. The best part of the move is that I’ll finally be back in the same state as Anthony, who started his new job in Scranton at the beginning of July. We spent the weekends together and the weeks apart – we are clearly not built for this arrangement and I can’t wait to be with him every day again. Anthony lived in Connecticut since he was 5, so our move to Pennsylvania is a big change. He’s already in Scranton and loving it, and I wanted to make him a little present for his new office. 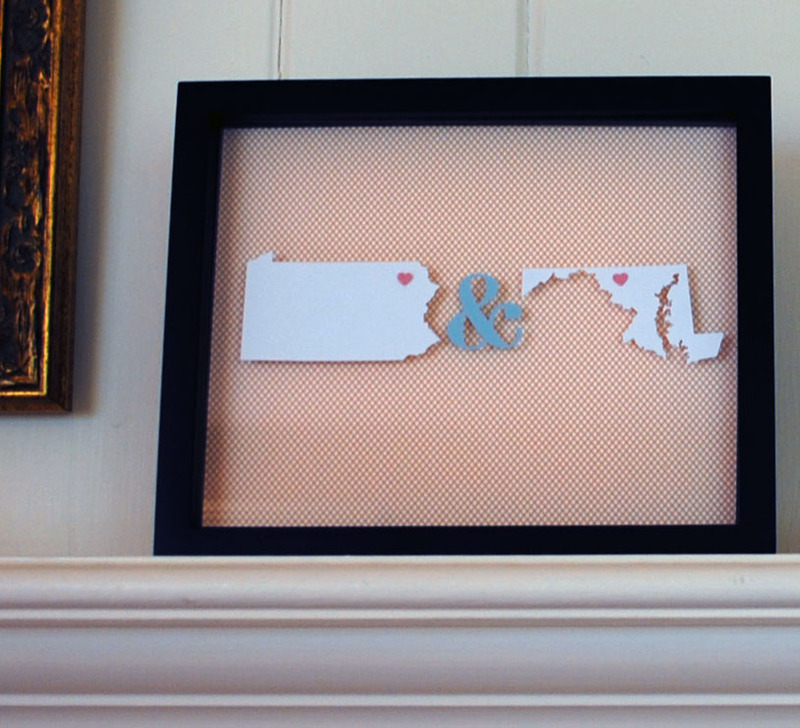 I used my Silhouette to cut out our two states and the &, then used little heart stickers on our home towns. I mounted the pieces with little foam stickers to a printed background pattern, and the framed it in a shadow box. I love it and will probably make another version for our house, since this one is going in his office. 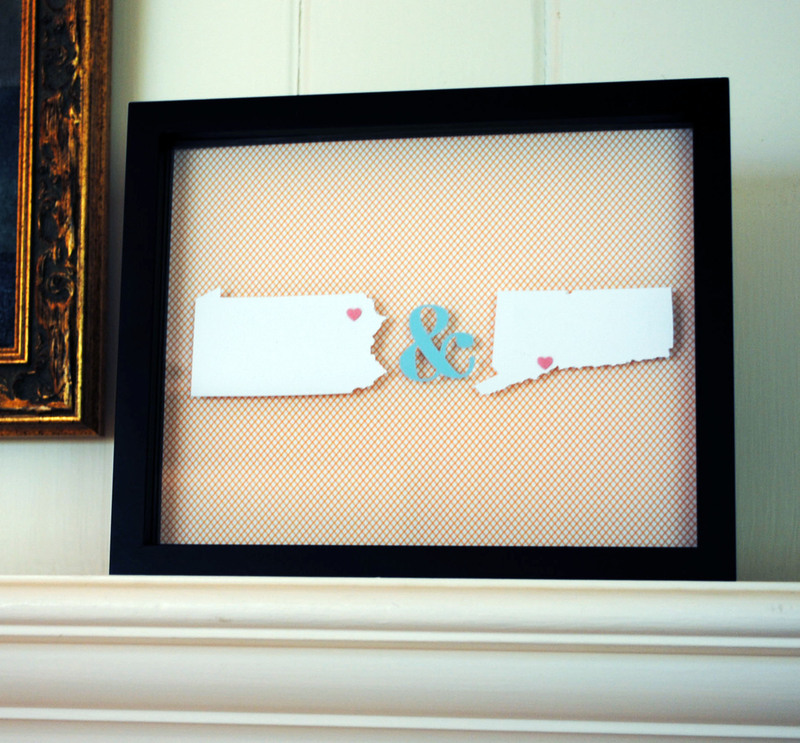 I made another one for my friend who just married a boy from Maryland. Kids are Awesome – what do I do with them? At the beginning of August, I am going to be babysitting for my niece and nephew for a few days. They are hilarious and super active, and I have been looking around for a few projects and games that will keep them occupied and happy. 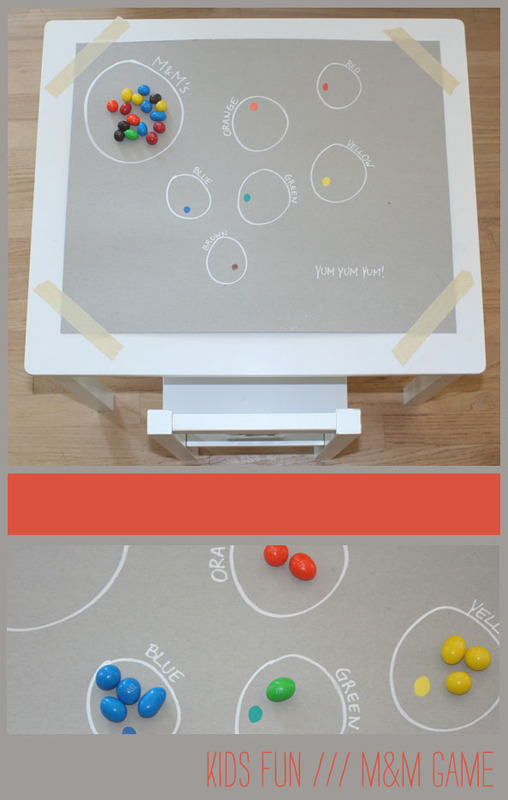 This is an amazing idea from Tokketok for a M&Ms color game. 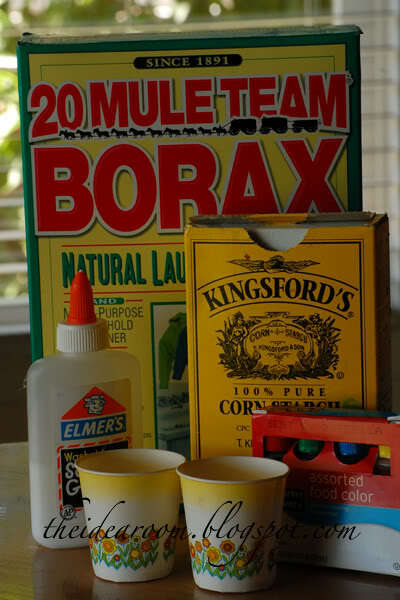 We’ll definitely be making our own bouncy balls, following these instructions from the Idea Room. Who knew you could do that?!? 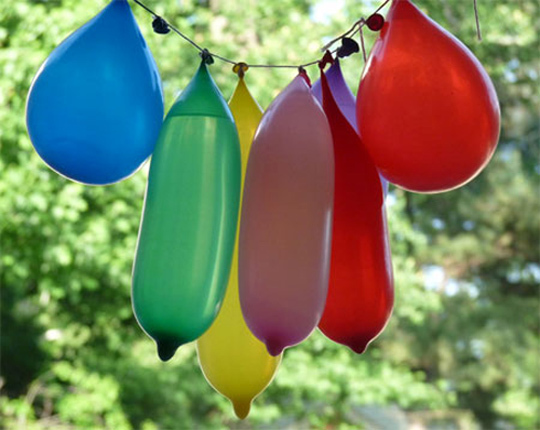 If it is as hot in August as it has been in July, this water balloon pinata from ohdeeoh might be perfect. I also love to bake with the kids (my nephew is great at cracking eggs! ), so I already bought some small condiment cups to make little muffins or cupcakes, like these ones from Holiday with Matthew Mead. It is going to be so much fun! 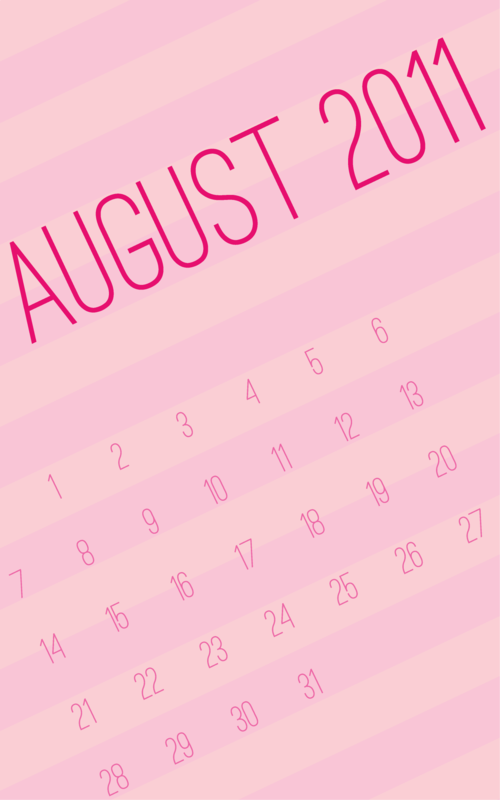 We’ll be moving into a new apartment in August and we need to pick paint colors – yay! I have been collecting pictures of some of my favorite rooms using Pinterest, and I’m narrowing down the selection. 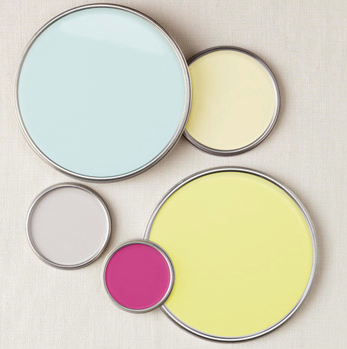 I love this palette from Better Homes and Gardens. The floors in the apartment are fairly dark wood, and I think this palette would keep it bright and sunny. (I’m really tempted to do something crazy like the dark pink in the second bedroom, which I’ll use for sewing/crafts). I really like light blue for our bedroom, especially with a blue ceiling, like in this room from Southern Living. 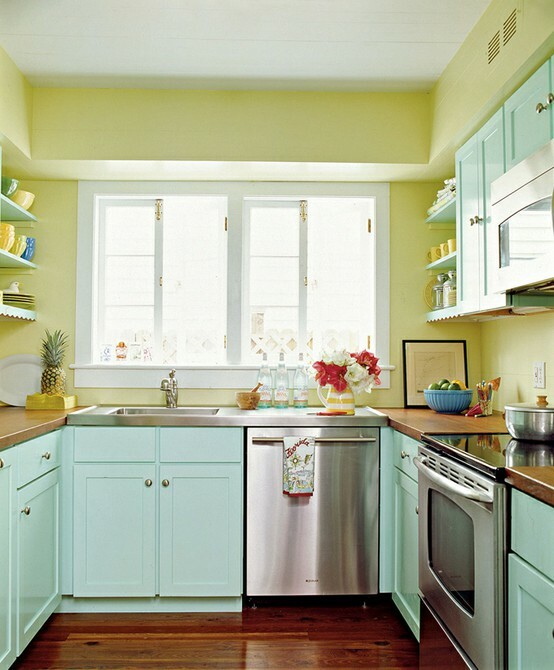 I love this kitchen via House of Turquoise. The kitchen in the apartment has less-than-awesome cabinets, but I have seen a TON of really great painted cabinets lately. Maybe we could give it a try? Our couch is bright pink plaid (sounds crazy, but I love it), so we definitely do something neutral in the living room. I like how this yellowish-tan color works with the bright colors in this living room (also from Better Homes and Gardens). I have less than 3 weeks left at work, then I get to start putting together our new home and spending some quality time with my niece and nephews. I can’t wait! My sister is having a party for my new nephew in August and she needed some invitations. I continued indulging my obsession with stripes with this design. 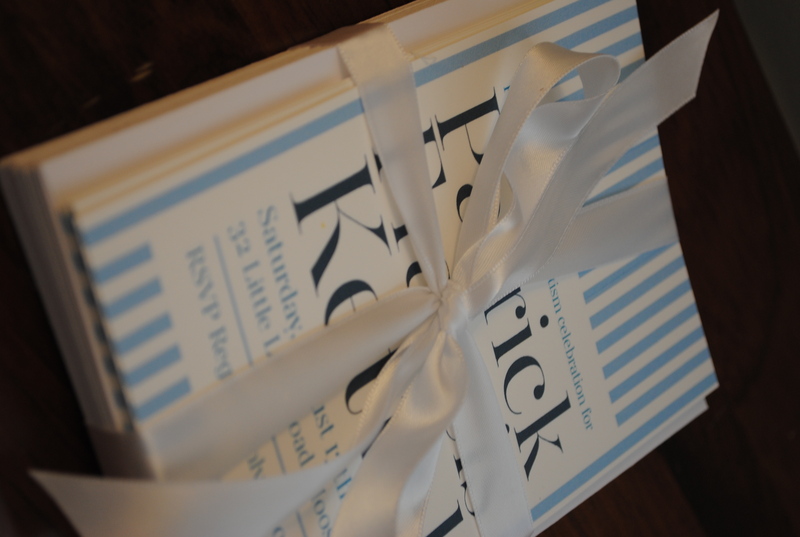 The most satisfying thing about finishing a stack of invitations is tying them up in pretty ribbon and sending them off. 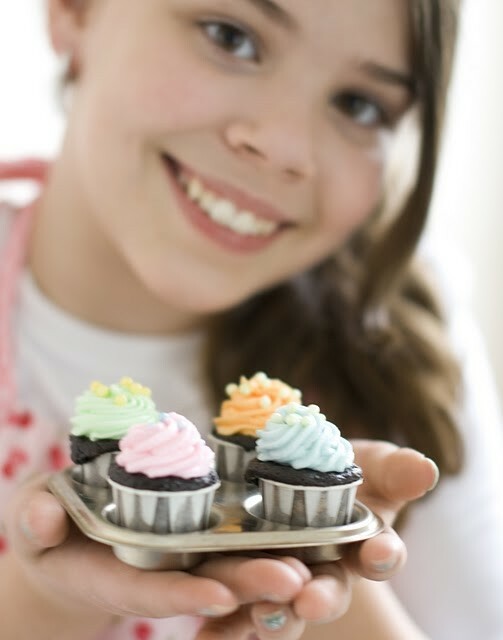 My next step is finding some good desserts to make for the party. 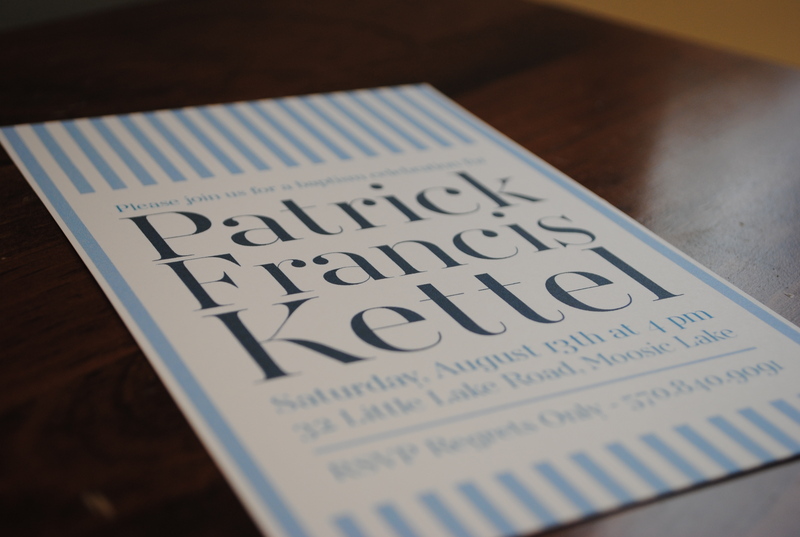 I am thinking of a vanilla cake with blue and white layers to match the invitations. 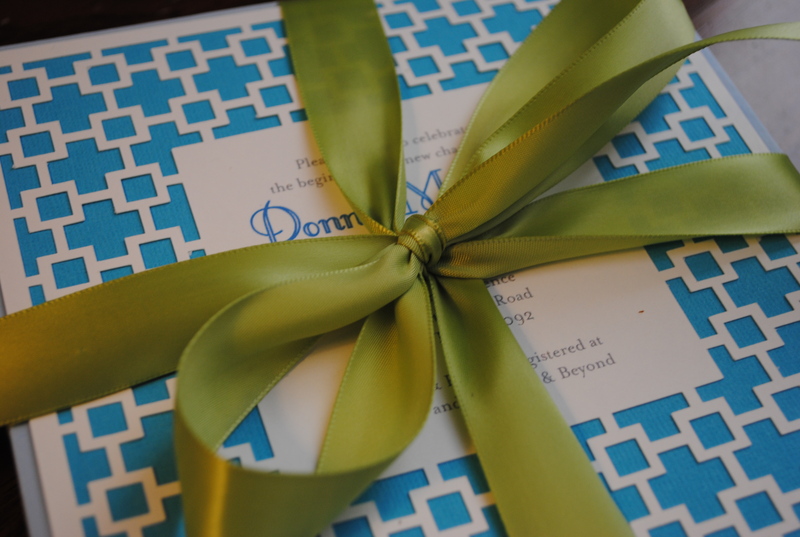 I was very busy this weekend making 2 different sets of invitations. The first one is for a shower that my mom is having for one of her co-workers. I got to try out the print and cut feature on my Silhouette and I was so happy with the result. It was a ton of work, but I figured it out and can’t wait to find more projects to print and cut. 1. 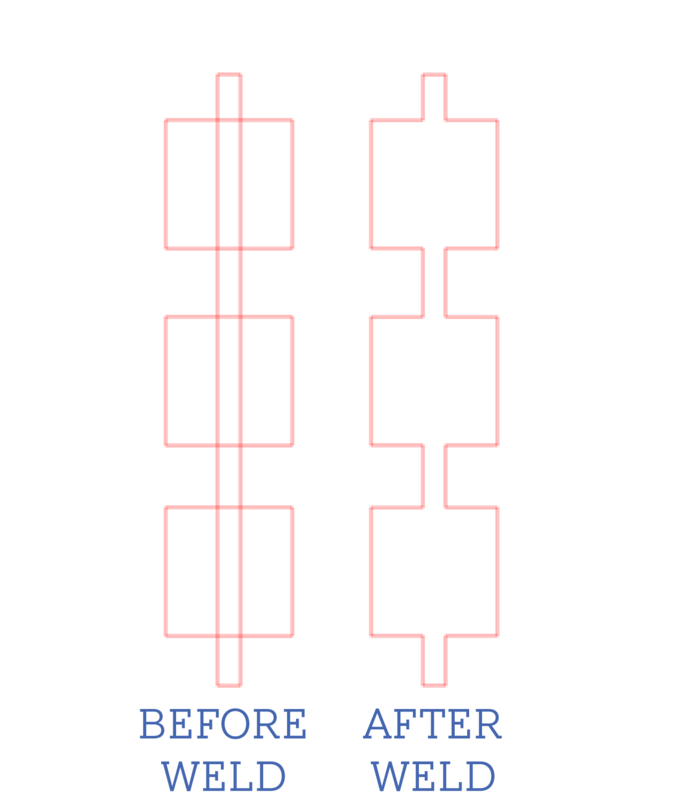 The weld feature is super helpful in creating complex shapes. I created small individual boxes, then added the long skinny box connecting them. I selected them all and selected Object > Modify > Weld, then they became one shape. 2. PNG files work best for printing. 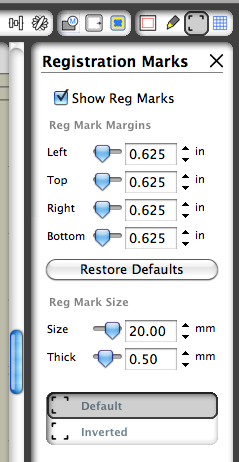 Once you have your cut lines set, create the print section in Illustrator (or whatever you like to use) and export as a PNG. I tried PDFs, but the printing was blurry for some reason. 3. Registration marks are your friend. When I was imagining this project in my head, I could not figure out how I was going to line up the printing with the cutting. Luckily, the Silhouette is a genius and has an eye that sees the registration marks and knows exactly where to cut. 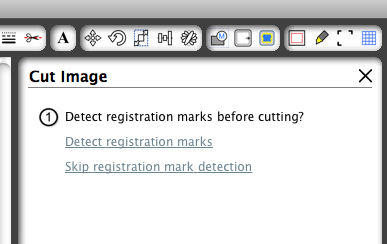 Open the Registration Marks window before printing from Silhouette Studio, and click on the Show Registration Marks box before printing. Your printed pages will have the registration marks, then before you send them to the Silhouette to cut, choose Detect Registration Marks. 4. Make sure you cut hard enough. The first few pages that I sent to cut were trouble. 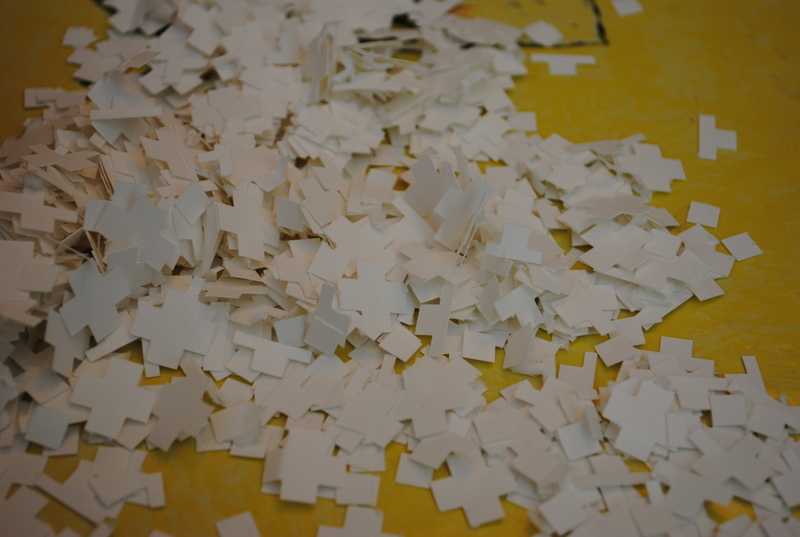 I didn’t set the right cut pressure, so I ended up having to punch out a lot of the little pieces. Once I got the pressure right, It was super easy. I just ended up with a pile of confetti when I was done. Once I had all of the pieces cut, I left them under a big stack of books overnight, since they curled up a bit when I peeled them off of the carrier sheet. 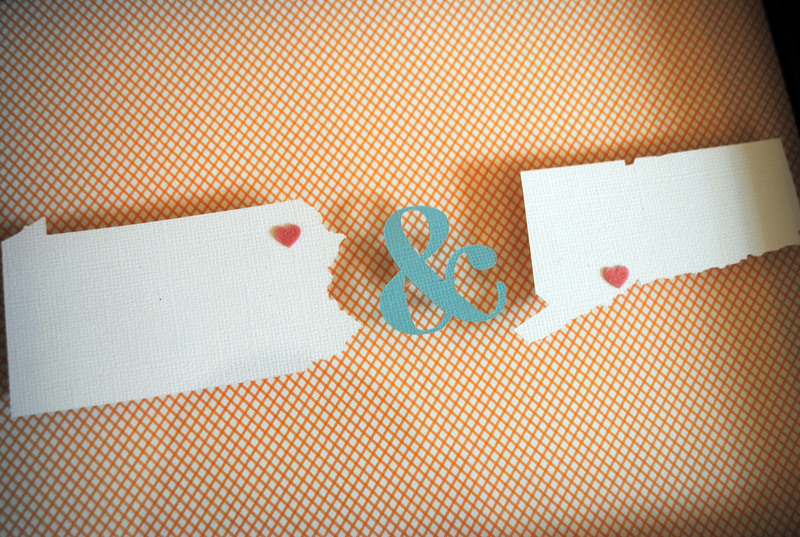 The next day I glued them to a solid piece of cardstock cut to fit, and they were all set! 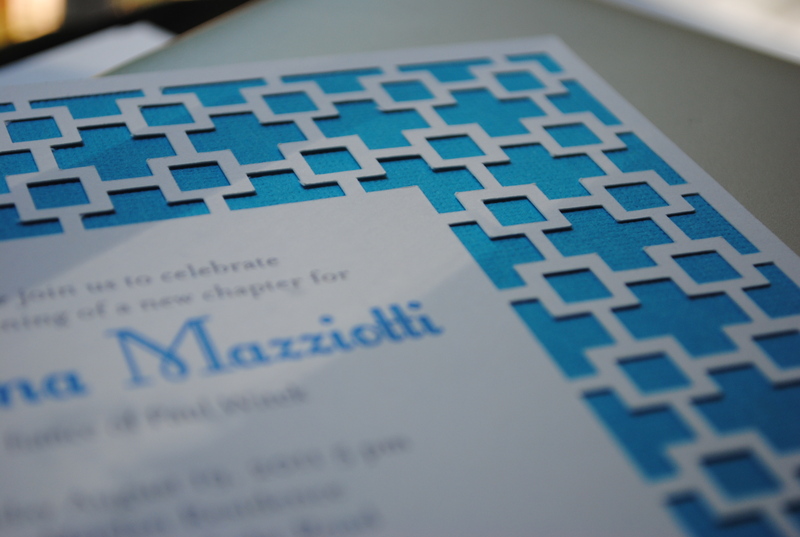 If you are interested in in making them on your own, here is the file I created – Box Invitation Pattern. Let me know if you end up trying it! It is set up for 6.5″ square envelopes, but it can be scaled to any size. Before we leave Connecticut for Pennsylvania, Anthony and I are planning a party for all of our friends here. In the past 13 years in Fairfield, I have met some of the most wonderful people in the world we wanted to make them burgers and cupcakes to thank them for being awesome. 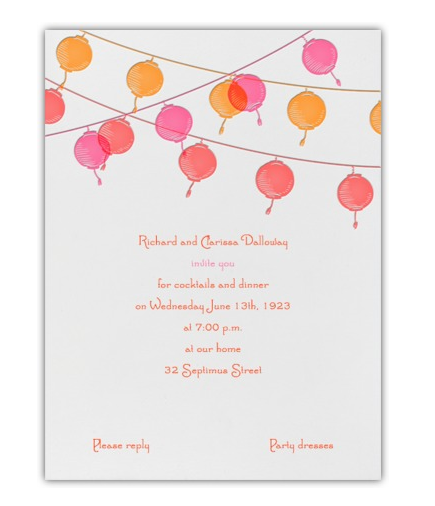 I picked this pretty email invitation from Paperless Post. It was easy to add the info and customize, and the email has an awesome animation of the invite coming out of the envelope, which even includes a liner! We’re having the party in the back yard of Anthony’s parent’s house (since we already moved out of our house), so I am looking for some cool but cheap ideas for lighting. 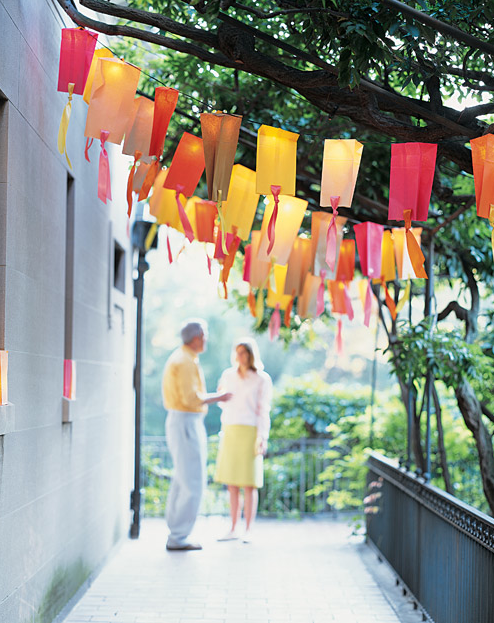 These paper bag party lights from Martha Stewart are perfect. We’ll probably go with burgers and hot dogs on the grill, plus some salads and really good desserts. 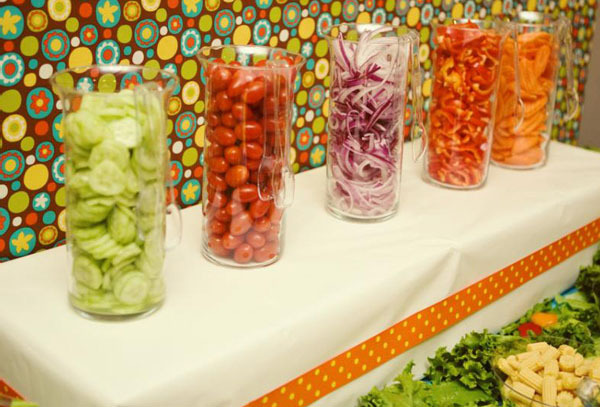 I am IN LOVE with this idea for a salad bar from Hostess with the Mostess. It’s perfect for picky eaters (like me) who usually end up picking around certain vegetables in a pre-made salad. 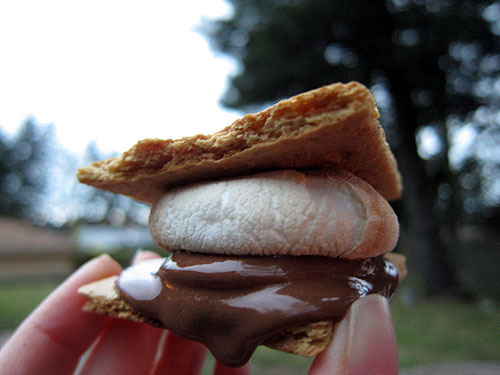 Once it gets dark, we’ll make s’mores. NotMartha made fantastic-looking ones with peanut butter cups. Best idea ever.